PSST! Want to jump right to the tutorial? 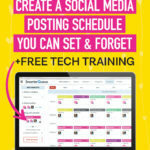 Click here → Social Media Posting Schedule With SmarterQueue Tutorial. 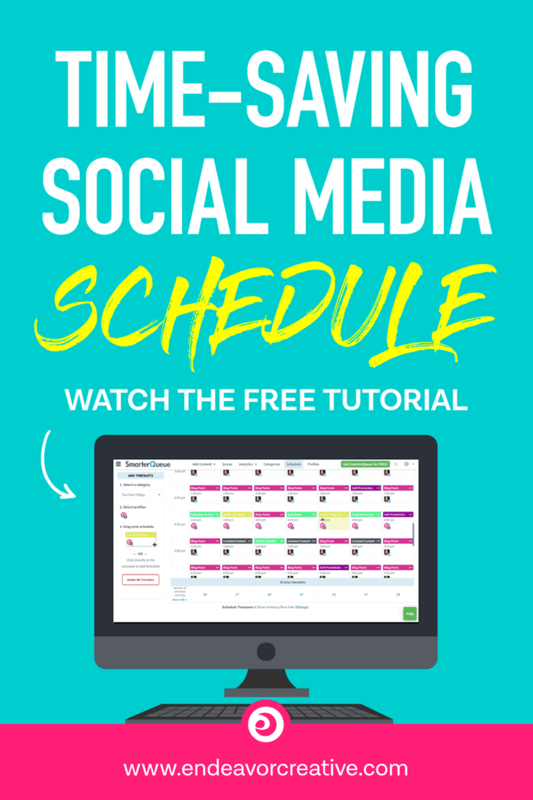 A lot of people ask me how I schedule my social media posts, so today I thought I’d pull back the curtains on my strategy and show you what’s worked for me and exactly how I’ve created a social media posting schedule that runs on autopilot. If your audience isn’t filled with the right people, you’ll be wasting your time and we can’t have that. 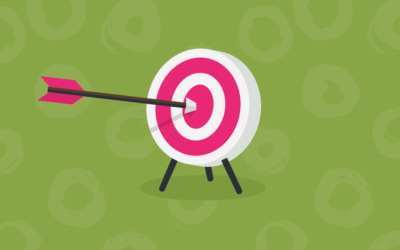 To get results, it’s all about providing the right content to the right people. Hold up. 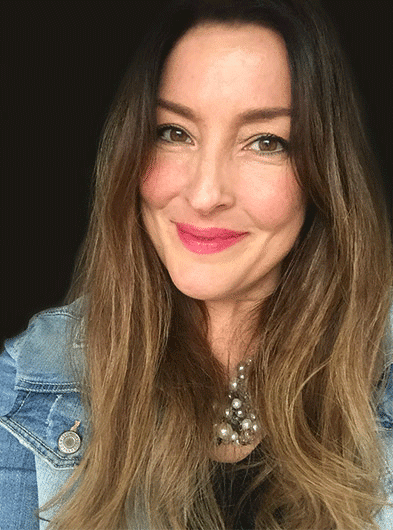 Why would you not just want to create a following of potential dream clients? Because the people who are going to be most likely to share and engage with your content are going to be your allies, not people who don’t know you yet. Most especially this is going to include professionals in your industry and people who are also serving your niche audience. They’re looking to curate content that will help their customer who is also your customer. Always start with your end goal in mind: what is it that you sell? 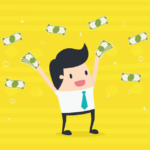 You want to be sharing content that will move people toward an eventual sale. If you have a blog, these will be your blog categories too and you’ll want to limit them to 3-5 or so. If you have too many categories you’re going to drive yourself crazy and your audience is going to have a hard time figuring out what you do. You’re going to help your audience solve problems relating to the things you sell by creating and sharing free content. When people ramble on about “providing value” on social media, this is what that means. Demonstrating your expertise and helping your audience with free content is the way to build trust and awareness, and when they need more help than your free content can deliver, you’ll be the one they’ll trust and buy from. It’s simple when you break it down like that, right? But I really wanted to show you that because I still see so many people overcomplicating it, getting overwhelmed, and feeling confused about what they should be posting to social media and what types of content they should create. The more you understand your audience and what they’re struggling with, and the more you get focused on what you want to become known for (what you sell/the problem you solve), the easier it is. Pay attention to the things that get the most engagement and drive the most traffic. Then, double down on those topics because your audience is telling you exactly what they want. Keep paying attention to the questions your customers are asking, where they get stuck, the things they struggle with. Your potential customers out there have those same questions and problems and you can address them with your content. Another big mistake people I see people make is dabbling with all the social media channels but not getting anywhere with any of them. And I get it. We’re bombarded with “You need to be on Instagram!” and “The only way to build authority is to lead a Facebook group!” messages and it’s hard not to feel the pressure, we don’t want to miss out on some big secret formula that’s going to get us visible. But here’s a secret you can bank on: there are many tactics that’ll get you visible, but if you’re not truly committed to showing up and being consistent, you’re just wasting your time. Practicing restraint and being realistic is the best thing I ever did to help me gain more traction on social media. While I have a presence on nearly every social media channel out there, I started out by focusing on just two channels: Twitter and Pinterest. What I did not do is focus on Pinterest, Twitter, Facebook, Instagram, LinkedIn, Snapchat, Tumblr, Google+, Reddit… you get the point. That’s insane unless you’re a full-time blogger or you have an assistant. Once I got a handle on that (and it took months guys), I moved on to Facebook. I’ll tell you exactly why: I’m not there yet. I’ve gone from virtually zero on Pinterest to having over 100k views per month. Here’s the even better news: As a result of these efforts, I’ve connected with collaboration partners, booked clients, and made sales. I’ve even been offered jobs! This is what matters, not the vanity numbers–that will come in time because my reach only continues to grow as I keep consistently showing up. How do you choose which channels to focus on? It all depends on where your ideal client is likely to be. Instagram is great for building awareness if the service you sell is visual and especially if your audience skews younger, but it’s not going to drive much traffic if that’s your goal. (You need 10k followers to use Instagram Stories to create clickable links that drive traffic). 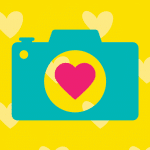 So if your audience is on Instagram and you love Instagram, that’s what you’ll want to shoot for. If you’re looking for 365 days of content ideas that include “funny memes,” “inspirational quotes,” and “shout-outs” you won’t find it here. 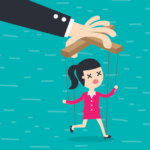 All of those things are fine, but without a strategy behind them these types of things are just contributing to the noise and they’re not going to get you noticed, help you build authority, or become a go-to expert people trust and engage with. Your goal is to build up a library of original, high-value content to share to your social channels. Key word: goal. It’s going to take time and patience to build that up, but this should be your first priority when you’re planning what you’ll post to social media. Can this content be search optimized? Does this content help me convey the core values of my brand? Does this content help me establish credibility and authority? Does this content help people to know, like, and trust me? Does this content help my target audience? Does this content help move people toward a next step? Have I put my own twist on a common subject? You don’t have to tick every box with every piece of content, but you don’t want to just post for posting’s sake. Even your inspirational quotes, funny memes and shout-outs should be in alignment with your brand. Don’t try to do all of those things to start―just choose one primary way you’re going to create content and get a good handle on that before you start dabbling with other forms of content. It’s not about creating as much as you can, it’s about earning trust and being consistent. So take your time. Maybe you can create one blog post, video or audio per week or even per month―that’s great. 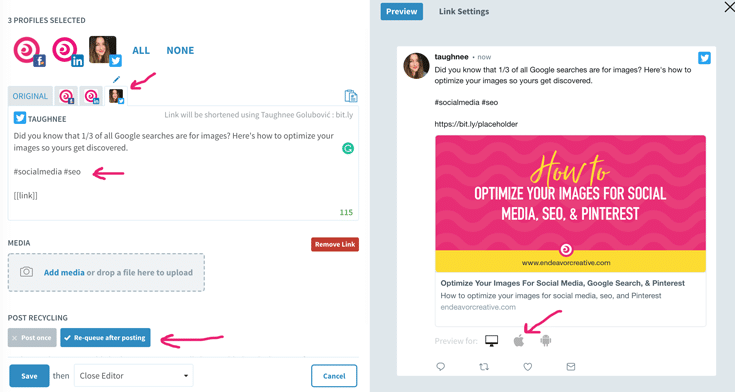 It won’t take long before you have enough content that you can start re-posting and promoting that content on autopilot. The occasional “get to know me” selfie with a personal anecdote, joke, or story. I get the most engagement on the last type. 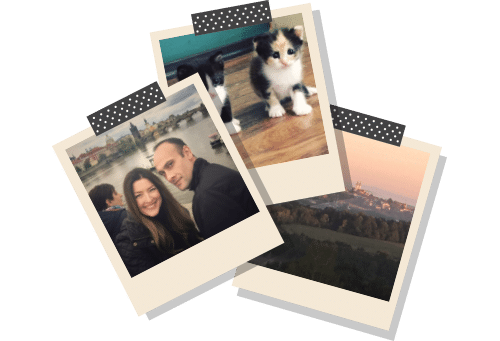 Try it out for yourself–add some selfies into the mix and share a personal story or a funny quip and see what happens. I’ll bet you a donut it’s going to perform better for you than other types of posts. People on social media appreciate when you show up as a human-person. I don’t want to fill my queue up with “me, me, me” content. It’s not about me, it’s about me helping my ideal customer and building that trust, so I only sprinkle this type of content here and there. But, I do want my audience to get to know me (people hire people they like and relate to) so in a way, these are just as important as the blog posts that take me 15 hours to write. Now I may not be everyone’s cup of tea, but the more “me” I can be on social media, the more I’ll attract people who are going to be the right fit. Because it’s content that doesn’t link anywhere, these types of posts are not going to drive traffic. But it does help you stay visible, build awareness, and stay top-of-mind. 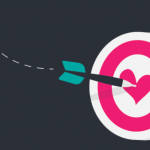 With these, aim for engagement rather than traffic–likes, comments, shares. These types of posts work particularly well on Facebook because they’re all about keeping people on the platform. I create these Quick & Easy posts in “batches” so it doesn’t take up a ton of my time. If you’re not a designer and want to create cool branded quickies like this, I’m really digging Visme. I keep a spreadsheet filled with ideas and when I have a bit of free time, I sit down and crank out a whole bunch of them–as many as I can–and then load them into my social media scheduler SmarterQueue (more on that in a sec). I keep my queue filled up with short little how-do-you-dos like this and as you can see, with a tiny following (< 300), the organic reach ain’t nothin’ to sneeze at! This post reached 261 people and it was not boosted. Not bad. Some people have abandoned Facebook because they’re not organically reaching thousands of people but to me, a tiny service business, 261 people is 261 freaking people. For free. I’m not mad about it. This is perhaps the most important rule of all. If you’re being random or willy-nilly with your social media efforts, you’re going to have a tough time building awareness and trust. There’s a lot of competition out there–your dream clients are exposed to up to 10,000 brand messages every single day. Most of what they see they’re going to scroll right on past. That’s why you can’t just post once, you have to keep showing up every day. Yes, every day. That’s what visibility requires. But hang in there with me, I’m going to show you how you can automate much of this in a “set it and forget it” way. 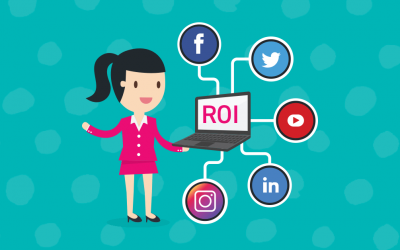 Before you create your posting schedule (oh hey by the way, you need a posting schedule), you’ll want to do some research into when your target audience is most likely to be on social media so they’re most likely to see your content. DO NOT just post “whenever.” You’re busy running a business and you want to get the most out of social media, right? Then you need to make sure you’re getting the most reach with every post. As a starting point, use CoScheule’s guide, “What 23 Studies Say About The Best Times To Post on Social Media” to figure out the peak times when your audience is most active. Keep in mind this type of research usually focuses on the Eastern time zone in the USA. You’ll need to adjust accordingly if your audience is not in the states. Now you want to go to your social media profiles and find out when your audience is most active. 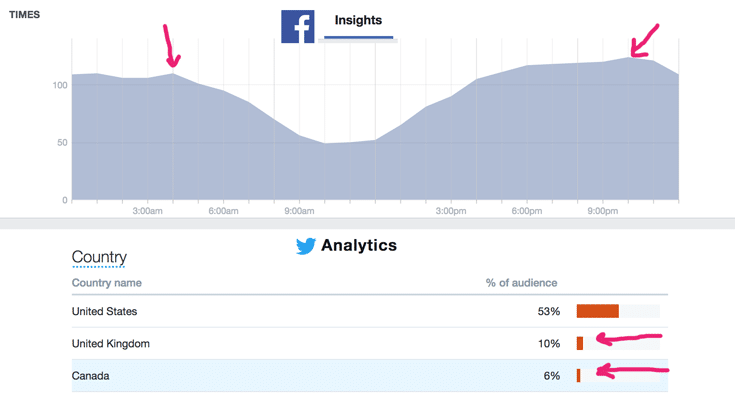 All your social media accounts will have insights and analytics for you to dig into. 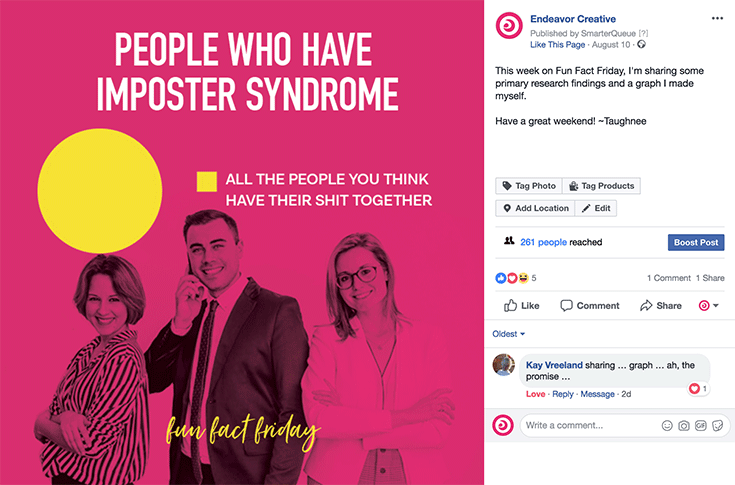 For me, I found out that the “when to post” recommendations you see floating around everywhere on infographics and in research (see above) was, for the most part, accurate–but totally missed a couple of KEY peak times for me. And, they don’t take into account time zones of secondary audiences. This should only take you a few minutes to gather up all this information. Keep this handy we’ll come back to it in a sec. Now you’re going to decide how often you want to post each day. Here’s some common wisdom as a place to start. I post around 10x per day to Twitter and 4x on Facebook. On Pinterest, I post around 30x per day. LinkedIn, Google+ and Instagram I post infrequently. That’s me. You do you. But just keep in mind that people tend to worry about looking “spammy” if they post too much, but it’s more common for people to NOT POST ENOUGH. You should be so lucky if you looked like a spammer, most people are going to miss your content most of the time. Sometimes it helps to see how other people do things as a starting point, but that’s probably not going to mean anything to you because I know (in my head) what each of those things is and the types of content that get shared under each category. But you can see that I’ve got a mix of original content, curated content and short posts (all the rest of that stuff) and where the balance is. Now that you’ve done your research on key time slots, your frequency, and your content categories, you can create your schedule. 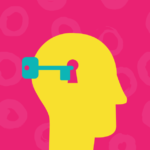 You’ll want to reserve your key time slots for your original, high-value content. For me, that’s my blog posts (see above in pink). 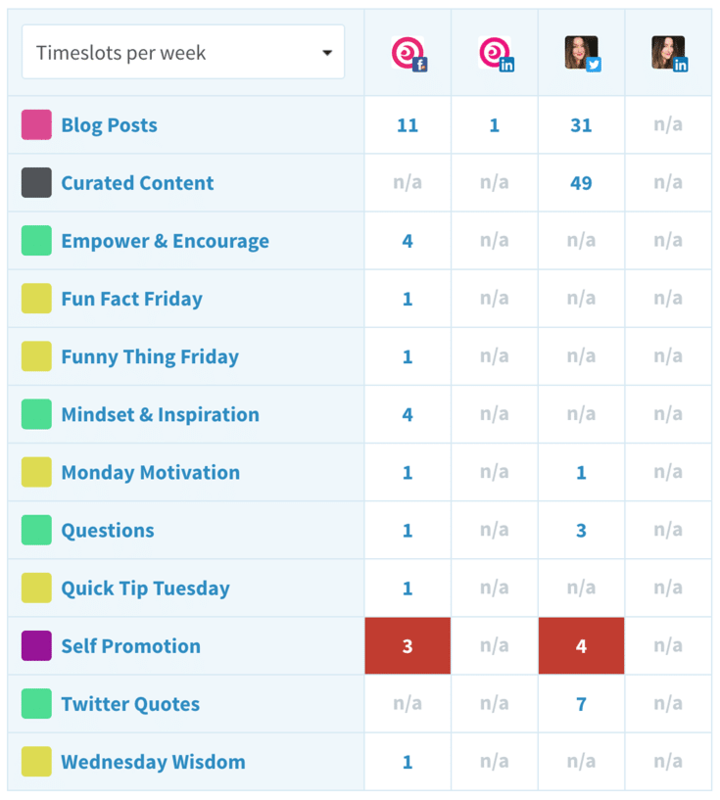 Once you’ve gone through steps 1-4, it only takes a few minutes to drag and drop all of your content categories into your time slots with SmarterQueue. Then, you’re ready to fill up those slots with content! I used to just wing it with social media, but since I started using SmarterQueue, I’m able to get visible on social media when I’m busy running the day-to-day of my business. THEN I AM DONE FOREVER!!! SmarterQueue handles the rest and publishes them to social media at the right times and will continue to re-post for me. 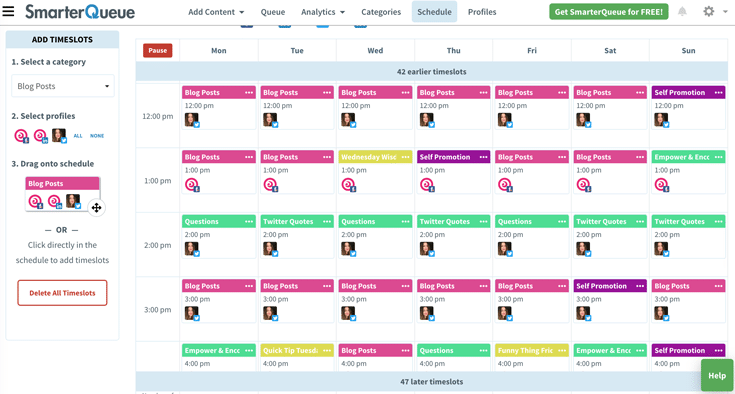 There are a TON of scheduling tools out there and I’ve researched and/or tried them all. Free: The free ones are going to be quite limited in what they can do for you, a lot will still need to be done manually. By the time I found SmarterQueue., I had already paid to test drive various schedulers, but once I really got in there and played around, I found they just lacked… it wasn’t as “set it and forget it” or as intuitive to use as I had hoped. Just as I was preparing myself to plonk down $50+/month (because I really wanted to free up my time, and that was still cheaper than hiring an assistant), I discovered SmarterQueue. All of that, but at a much lower price tag. I’m on the annual plan so I pay around $17/month. Plus you can connect Bit.ly and it’ll automatically convert all your links so you can get analytics on them. 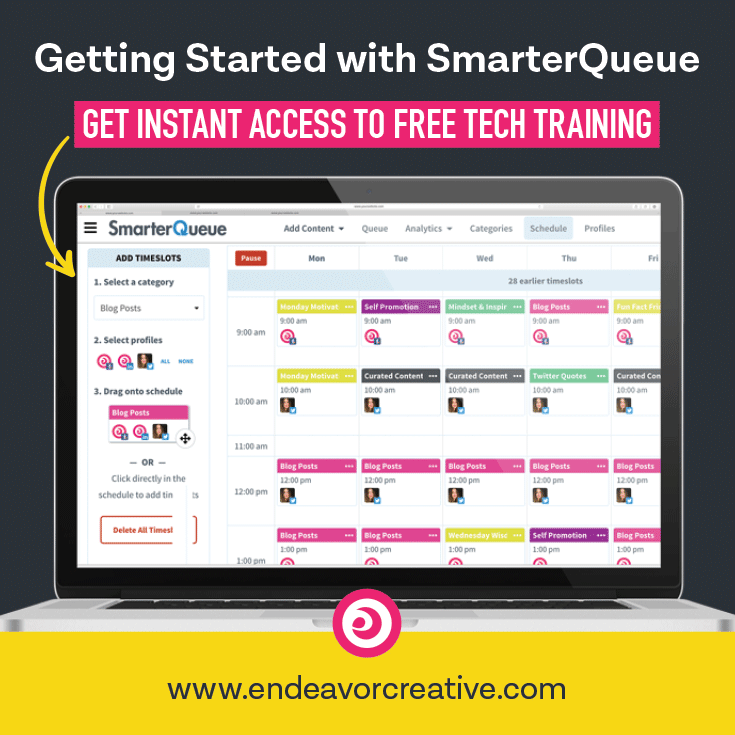 See it in action with my free SmarterQueue Tech Training. No sign-up required!